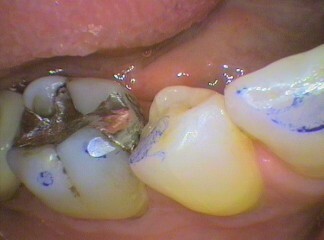 When the appearance of the excessive wearing of the enamel and the exposure of the dentine in young adults, it was seen as a grinding or bruxing problem. We now know it’s the softening of the enamel due to the high caffeine diet. However the issues, those are associated with excessive grinding, need to be corrected. 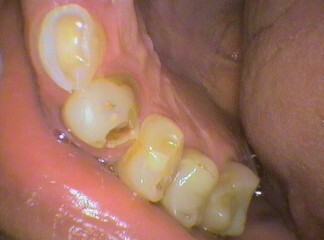 Firstly, change the diet to prevent further softening of the enamel. 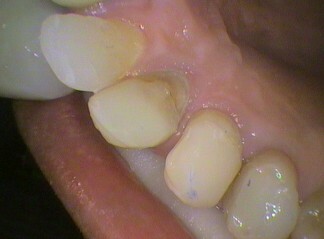 Secondly, apply tooth mousse to aid in the chemical repair of the enamel via the saliva. Thirdly, repair any exposed enamel and any treat any decay. If the grinding persists then bite treatment and jaw joint therapy may be necessary. Full assessment of the bite and any jaw pain. Adjust any excessive wear areas to make the bite even. Jaw joint therapy to correct any muscle problems. and allow the jaw joint to relax and heal. See a physiotherapist if there is any associated neck problems. The neck muscles support the lower jaw and jaw joint, so it’s important this area of the body is treated well. 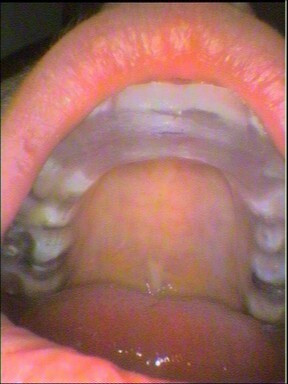 In severe cases the bite may need to be built up to a more normal bite by adding material to the biting surface of the teeth. Early treatment is vital to preventing life-long issues of the jaw joint complex of the teeth, muscles and jaw joint. Worn teeth from a heavy bite, causing filling to be lost Build up & fillings placed on teeth	 Occlusal splint on upper teeth to check	 Grind mark as a shiny flat edge on tooth. Thin blue carbon paper used to assess bite.